Singaporean model, actress and endorser of a plethora of products, Fann Wong reveals the real reason she is buying property in Kuala Lumpur. KEE HUA CHEE pricks up his ears. HEADS turn as Fann Wong glides gracefully into EEST at The Westin Kuala Lumpur, an ultra-hip Comme des Garcons leather jacket over a candy-pink layered dress by little known Japanese designer Ito. Her matching pink hairband adds a touch of girlish, Doris Day whimsy. In a private dining room, I stare at her unabashedly. Fann Wong declines to mention her age even if I agree to publish any lie. “Ask no question and you get no lie. Let’s not talk about my age,” she purrs sweetly. Singaporean actress, singer and model Fann Wong. She has a delicate, porcelain complexion so beloved of directors of Chinese period films. Her unusual name fans my interest. “My real name is Fann Woon Fong. Fann is my family surname. When I started modelling, the bookers asked me to have a Christian name so it was easier for clients to remember me. But I was very intent on my Chinese identity and very into my dialect name, so I refused. I insisted on being called Fann Woon Fong, mouthful or not. I wasn’t bothered if others found it hard to remember or pronounce. Two years earlier, while shopping at C.K. Tang with her mother and friend, they chanced upon a cover girl contest organised by Her World magazine. “My friend asked me to take part. I did as I wanted the free hairstyling and make-up by Lancome. They took pictures of me and I thought that was the end of it. Then I was told I was in the finals. She worked extensively in Taiwan where she was featured in an Oil of Ulan commercial which was broadcast in South-East Asia. In 1994, while modelling in Taiwan, a Singapore TV producer discovered her acting talents and cast her in a television drama series aptly named When Dreams Come True. Fann’s diary quickly filled with work as she starred in two more TV series, The Challenger and Chronicle of Life. The latter won her Best Actress and Best New Actress in the 1995 Star Awards. Overnight, she became a household name in Singapore. She went places to shoot more TV drama series – Shanghai (for A Romance in Shanghai), Sydney (Wild Orchids) and Amsterdam and Belgium (Brave New World). Fanntasy was a Mandarin pop album which went on to win four platinum sales awards in Taiwan and launched her singing career. She had the honour to sing Moments of Magic, Singapore’s official millennium song and, in 2000, became the first Singapore solo singer to stage a paying concert at the Singapore Indoor Stadium. At first her parents were against her joining the entertainment world though now they are her biggest fans. “Dad was scared by stories of drugs and wild parties,” recalls Fann. Her mother was more agreeable, considering that she was instrumental in that fateful Her World contest. It was a major coup of the swooning sort when director David Dobkin announced that Fann Wong would star opposite superstars Jackie Chan and Owen Wilson in Shanghai Knights, the sequel to Shanghai Noon. Apart from her leading men, it was also a huge Hollywood movie on a mega budget, the sort dreamed of by every anak wayang in Malaysia and realised only by Datuk Michelle Yeoh. As for her music career, “last year I did a compilation of my hits but hardly found time to promote the album so that’s unfair to the recording company and myself. I am slowing down my singing career to concentrate on acting and endorsement work,” says the economics-inclined lass. Her ambassadorial role for Xando, a slimming health programme, certainly comes in handy as she is also the spokeswoman for New Moon abalone and bird’s nest. She shows off a stunning, chunky and expensive-looking watch by Delacour. “I am also the ambassador for Jacob & Co watches.” Plus Bella Skincare and Ginvera Shampoo. And now Tiffani by i-Zen, the luxury condo concept by Ireka Land and CapitaLand. Malaysian-owned Ireka Land cut its teeth with the phenomenally successful Kiara I, Kiara II and Villa Aseana while CapitaLand is one of Asia’s biggest listed property companies. 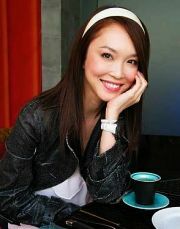 Fann Wong has bought two units of Tiffani, one to live in and another to rent out, so we should be seeing more of her. “I like the Mont’Kiara location, only 15 minutes away from KL’s city centre. I love the green garden concept, which provides peace and beauty. To me, the home is my temple, my sanctuary, somewhere I look forward to returning after work. And the reason for buying property in KL is? a Malaysian boyfriend! Yup, Fann Wong’s boyfriend is a Malaysian but that is as much as I could squeeze out of her. He is averse to nosy parkers from the media and shuns the social glare although in Singapore they are known as a couple. Is the Tiffani condo at Mont’Kiara a wedding gift, a love nest or hideaway? Of course, she is not telling. Will the bells be chiming in the near future?